I was recently introduced to a moving virtual reality film titled “Clouds Over Sidra” by Chris Milk. This film lets us walk in the virtual shoes of 12 year old Sidra, a Syrian refugee girl living for the past 18 months in the Za’atari refugee camp in Jordan. To put it simply, the technology used to create such a realistic experience was awe-inspiring. To become totally immersed in this space through sight and sound was somewhat daunting as the enormous scale of the challenges facing our global society suddenly became very real. I would encourage you to view it using the virtual reality platform, even if you don’t have the Google Cardboard accessory. As far as the eye can see are rows upon rows of caravans, or makeshift “homes” for the 84,000 refugees who lived there when this was filmed. The nothingness of the space was overwhelming – both the natural and the manmade landscapes are almost entirely devoid of colour and “life”. We get to experience Sidra attending school, something she and her circle of friends are extremely proud of. Yet, they walk hand-in-hand along chainlink fences topped with razor wire to get to class. We also learn of the children who don’t want to go to school because they are waiting to go home to Syria. We see “boys being boys”, still keen to wrestle and fight even after all that they may have personally witnessed. We also see boys having access to computers to play games, most of them combat ones, which must strike a chord very close to their own realities. Yet, we see the limitations placed on the girls who are not allowed to use the computers, but are eager to. However, girls are allowed to play soccer even though they cannot play it back in Syria. But, playtime comes at a cost, as does so much else in Za’atari, as they have to “play quickly” because so many other children are waiting for a turn. Although there is safety from the war in Syria whilst in Za’atari, this temporary space has become a somewhat permanent home for thousands upon thousands of children and their families. In fact, the children outnumber the adults. For the children in Za’atari, the days, months and years spent here will be part of their childhood. No one is quite sure just how much of their childhood will be spent here. All anyone can agree upon is that it would seem that it will not be safe to return to Syria any time soon. The Za’atari population try to survive in this ambiguous space where they don’t have a home to move on to nor one to return to. Yet, many keep hope alive by waiting for the day when they can leave. It would appear that a goal as global citizens would be to ensure that the refugees can still fulfil a basic human desire of being allowed to dream and learn and grow whilst trapped in this space. A point in time will come when people can safely return to Syria. And it is evident by the amount of destruction there today that it is going to require the skilled assistance of educated and experienced people to rebuild communities and lives. So, what is being done to ensure this happens? With so few children regularly attending school whilst affected by the war, both within refugee camps such as Za’atari and elsewhere, we are not providing adequate education for them now or for their futures. Watching “Clouds Over Sidra” gave me a new appreciation of the refugee situation in Za’atari and of that affecting Syria, Europe and the rest of the world. And it is prompting me to think of what can be done by the likes of you and I – the bystanders who are physically so far removed from these circumstances that we find it hard to truly comprehend that these situations are in fact people’s lives, day after day after day. I would encourage all educators to view “Clouds Over Sidra” and to consider allowing your students to do the same. It is an experience not to be forgotten, and hopefully one that will spark conversation about this topic that will perhaps lead to positive changes for our global society. As part of my ongoing study into Learning Spaces and their role in education today, I have created an online presentation about learning spaces. To view it, please select the red, highlighted link above and ensure you have your sound turned “on”. Attached is the full transcript for the presentation, if needed. Both cooperative and collaborative learning are styles of group work, but what are the differences (if any?) and are they even worth using in today’s classrooms? Firstly, is there a difference between group work, collaborative work and cooperative work? Absolutely. The term “group work” is probably enough to make many educators (and parents) cringe as too often it has been used with vague objectives and little individual accountability towards a student’s own or peers’ learning. One student takes over, another doesn’t pull their weight, and sometimes students are not quite sure what they are meant to be doing towards the “project”. These are some of the reasons that some educators believe that group work just doesn’t work. However, collaborative and cooperative group work offer enhanced learning opportunities. Collaborative group work allows learners of varying abilities and personality types to explore units of work and share their thoughts and insights as they work together towards a common goal. When collaboration is working well it can lead to a deeper understanding of content, increased overall achievement in grades, improved self-esteem, and higher motivation to remain on task (Concept to Classroom. 2004). 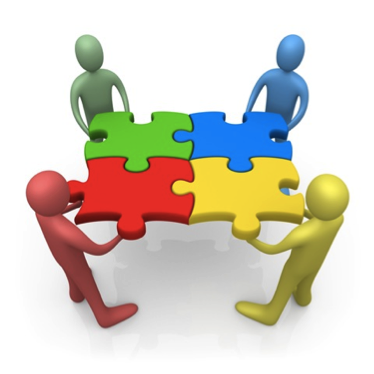 Cooperative group work is perhaps the most beneficial of the group work categories. Students work together in a small groups, specifically selected by the teacher, towards a common goal. However, in order to achieve this goal, each individual is accountable for their own work, and success of the group is assessed as a whole. Cooperative learning is guided by clear objectives and success of the group is dependent on the learning of each of its members. Cooperative learning can fall into two main categories – Structured Team Learning or Informal Group Learning. Structured Team Learning includes strategies whereby there are team rewards, individual accountability and equal opportunities for success. In many Structured Team Learning techniques, “students contribute to their teams by improving over their past performances” (Slavin. 2010. p. 163). Informal Group Learning techniques include the use of strategies such as Aronson’s 1978 “Jigsaw” (as cited by Slavin. 2010. p.168) whereby small groups are given a topic. This is then broken down into subtopics and allocated to each member. Members from various groups who are studying the same subtopic meet as an “expert group” to discuss their topic and then return to their ‘home group’ to share their learning. “Since the only way the students can learn material other than their own is to listen carefully to their teammates, they are motivated to support and show interest in one another’s work”. (Slavin. 2010. p. 169). This can be further extended in that each individual is assessed across all subtopics, which adds to a team score. When the task of the group is to make sure that everyone learns something, a much higher and genuine investment is given to ensuring one’s teammates understand as well. And the research shows that high achievers gain from cooperative learning as much as low and average-achievers (Slavin, 1995 cited p. 171). Overall, in order for group work to work, two things must be present – group goals and individual accountability. “Groups must be working to achieve some goal or to earn rewards or recognition, and the success of the group must depend on the individual learning of every group member” (Slavin. 2010. p. 170). Well-designed group work opportunities need to play a role in 21st century education, and cooperative learning in particular allows students to “master traditional skills and knowledge as well as develop the creative and interactive skills needed in today’s economy and society” (Slavin. 2010. p.173). Slavin, R. (2010). Co-operative learning: what makes group-work work? (pp. 161 – 178). In The Nature of Learning: Using Research to Inspire Practice, OECD Publishing. Most educators will be comfortable with utilising learning spaces one to four. Teachers are aware that most of their direct teaching has had to occur within the confines of the classroom and/or school. To a certain extent, this is then able to be reinforced at home via things such as homework, assignments, reports and so forth. Teachers are also more inclined to utilise group learning spaces during their time in the classroom and school, and the electronic learning space has introduced teachers and students to technology that can expand and/or simplify their experiences together (eg. Google Drive etc). However, one space which may cause hesitation for teachers is the online learning space. Some may have ventured as far as social media as a means of extending their connections with other educators, and perhaps even with parents and/or students directly. However, the online space is one that is growing rapidly. It is one that has a capacity to create a safe learning community for students to interact with one another and share insights and ideas and to reflect on the feedback, opinions and findings offered by their peers. As this article by Brown and Lippincott (2003) discusses the importance of education institutions not only acknowledging the expansion of the more ‘traditional’ learning spaces educators are accustomed to, but also ensuring that students (and teachers) will be supported to have success in utilising them. What have your own experiences with learning spaces been as a teacher? Brown, M. B., & Lippincott, J. K. (2003). Learning spaces: more than meets the eye. EDUCAUSE quarterly, 26(1), 14-17.